By Maurie Hassan from Transparency Maldives. On Sunday, June 26th, the national launch of Transparency International’s Global Corruption Report: Climate Change, took place in Male’, Maldives. Many state dignitaries, the media, and major local environmental NGOs, attended the event, organized by Transparency Maldives. 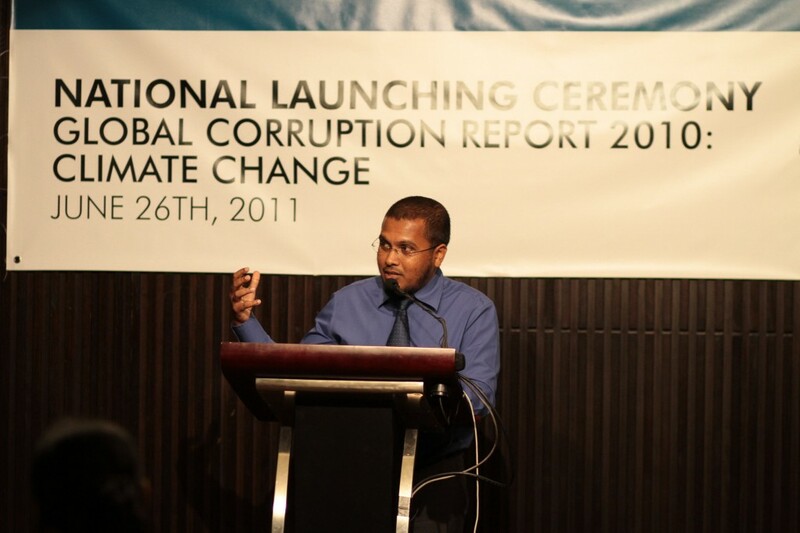 The function served as a starting point in the Maldives, for a wider public discourse on climate change beyond merely the environmental aspect of the issue, to focus on the task of incorporating anti-corruption safeguards in climate change governance. 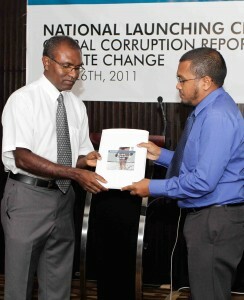 Both climate change and corruption are critical challenges that the Maldives face. A coral reef based archipelago, with an average land elevation of 1.5 meters above sea level, the Maldives is extremely vulnerable to the affects of climate change, such as sea level rising, as the GCR highlights. In international climate negotiations, as a developing country and a member of Alliance of Small Island States (AOSIS), Maldives has been a vocal advocate, for strong mitigation and adaptation strategies against climate change. The country is already a recipient of large amounts of funds for climate change mitigation and adaptation projects, under both bilateral and multilateral funding schemes. Similarly, the country is also grappling with corruption and lacks proper governance mechanisms to address the problem. 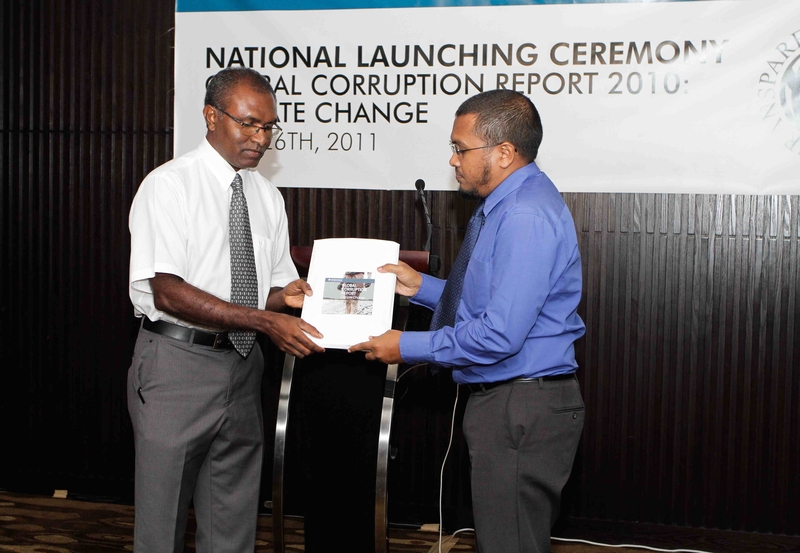 In 2010, Maldives was placed at 143rd on Transparency International’s Corruption Perception Index, with an average score of 2.3, indicating that perceived levels of corruption in the country is very high. Given this context, Transparency Maldives believes that it is vital to strengthen the governance structure of the country in order to properly manage climate change funding and therefore meet mitigation and adaptation targets. During the launching ceremony of the GCR, the chief guest of the ceremony, Minister of Finance and Treasury, Mr. Ahmed Inaz, highlighted some of these issues and pointed to the importance of efficient use of climate change funding and the need for transparency in all processes. The Minister also noted that one of the challenges, in the Maldives, for management of climate change related projects is as a result of limitations in human resources and lack of local expertise in the field. The event also included a speech by Mr Hamza Khaleel, a British Council’s Climate Champion and a member of the climate governance network that Transparency Maldives is establishing as part of it’s work on the Climate Governance Project-a collaborative initiative with five other national chapters, managed by Transparency International. Mr. Khaleel spoke about the need for the Maldivian Government to lead by example when it comes to accountability in climate change governance. The national launching of the GCR was widely covered in the local media and many of the attendees to the event noted the importance and need for urgent action in strengthening climate change governance. ← Will the World Cup and Olympics bring more corruption to Brazil?